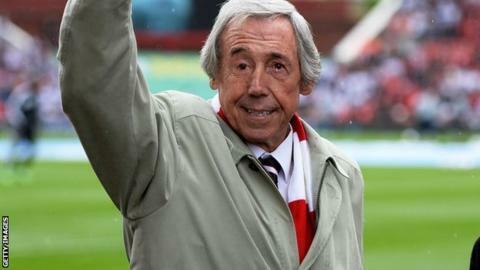 Stoke City legend Gordon Banks says the team are playing "better football" this season under manager Mark Hughes. Hughes replaced Tony Pulis last May, and the Potters need four points from their last three games to record their highest Premier League points tally. Club president Banks said: "Since Mark has taken over, the style has changed. "Obviously, though the public liked us to stay in the Premier League, they do appreciate that we are playing better football, like some of the top clubs." Under Pulis, Stoke won promotion to the Premier League in 2008 to end a 23-year spell without top-flight football and finished runners-up in the 2011 FA Cup to Manchester City. But his team's robust and direct style of play brought criticism from rival managers, such as Arsenal's Arsene Wenger, and latterly from his own supporters. Currently, Stoke have won four of their last six games and are now two points behind ninth-placed Newcastle. "We're keeping possession a little bit more [under Hughes]," Banks told BBC Radio Stoke. "We're keeping it on the floor a bit more and we're going forward and getting back as a team and by doing that we're creating more chances to get shots and headers in at goal. "The players obviously believe in Mark Hughes and if, come the summer, he can now buy two or three quality players that can make us even stronger then, who knows, we could have a really good season next season."